Laying and fixing track doesn’t seem difficult. But then you try it. It’s surprising how many problems can be avoided with the benefit of hindsight. Here’s the technique I’ve developed over the years that’ll hopefully save you time, effort and frustration. If you’ve ever locked your N or OO railway track in place only to find your trains judder, stop or derail on bends or points you’ll understand the frustration and annoyance of poorly laid track. 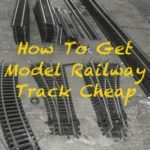 Equally, it’s much harder to secure track in place without damaging the sleepers, rails and electrical connections than many novices expect. Here’s a technique I’ve learnt and now use for stress free track laying and fixing. Having sections of track that aren’t aligned or connect correctly will cause all kinds of problems later and aren’t easy to correct once the track is permanently fixed. Juddering locos and even derailing trains can result on misaligned track. The solution to this is to mark up the track position and first secure it temporarily – I used double-sided tape. Then test your trains run smoothly, prove the electrical connections work and your trains navigate joins, points and bends without problem. If they don’t it’s easy to pull up track, correct problems and retry. After the track is correctly aligned lock it down more permanently. For this track pins are ideal but sections will often move while knocking the pins in so I first further secure it in place with small screws between the sleepers to hold track in place during the pinning. 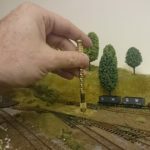 Many tutorials and guides across the web are for OO or H0 gauge track laying and won’t apply on smaller N gauge tracks. The tips here are will however work for N, OO and HO. The screw should fit between two sleepers but have a head wide enough to overlap the sleepers and so hold them in place. Place a small piece of cardboard with a V cut into it to between the sleepers and screw head so as not to damage the sleepers while tightening the screw. The picture above shows the track held down with double sided sticky tape and the screw being inserted with the card sleeper protector in place. With the track now securely in place take your rolling stock for further trial runs to catch any electrical or join problems that have crept in as the track moved while the screws were inserted. With the track in place pull out the double-sided tape and the use an Archimedes screw (pictured) to make the holes into the sleepers for the pins and gently hammer them in. Obviously check the size of the drill is small enough to fit comfortably within a sleeper. 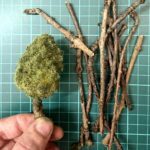 (See model railway building tools for other tools that can save you time and effort). One of the biggest improvements to the smooth running of my trains came with the discovery of Jewellers stamps. Looking back, I can’t believe I used to just take a hammer directly to the pins and the resulting damage to the rail heads that occurred. A punch, like this one – pictured, costs just a few pounds but will save your rails. With the track now firmly held in place with track pins, remove the screws. 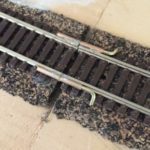 Your track is now laid and is ready for Ballasting. 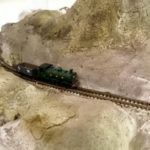 This is outside of the scope of this post and I’ve covered it before (Three Top Videos On How To Ballast) so I won’t say more. With your track and ballast in place you can now take your Trains for a well deserved excursion safe in the knowledge you won’t have track problems. 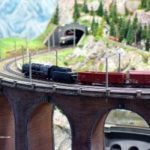 > This is one of a collection of posts in my super series on building model basic model railways. 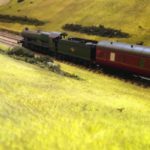 If you have any questions about building a railway please connect with me on Twitter (@modelrailwayengineer) or drop me a line via the contact page. 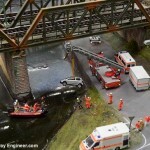 Just a note to thank you for sharing your your expertise on model railways. Take for instance the jewellers stamp, brilliant. I have been using a small pin pusher but this seems crude to the jewellers stamp. Thanks Laurence, appreciate the kind comment. I don’t know the availability of jewellers stamps, why not file the end off of a 3″ or 4″ nail? Proper nail punches are available from Screwfix at a reasonable price. Hi Les, that’s a great idea about using a nail! Nail punches were my first thought but I found the nail punches in Screwfix and other DIY stores too large. Hello, I would prefer to use “Electro Frog” Points. As cost is a consideration would I be able to use these without a point motor and instead operate them manually for the time being? Hi Phil, there’s no reason why not. As a tip, even if you don’t plan on using motors now, drill the holes for them (assuming under-board motors) when you fit the points, it’ll save you a lot of work later. I’ve just seen your advice sheet. Pity I didn’t see it before making “mistakes”!would like to know more about how to use a jewellers stamp to apply n gauge pins to track.